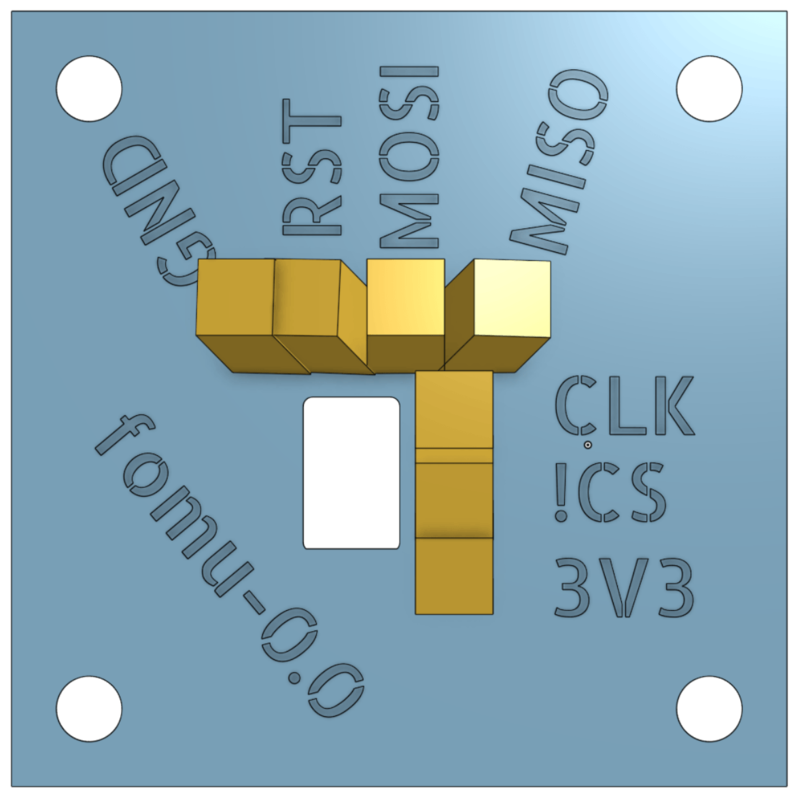 In summary, Fomu is a small (9.4 by 13 by 0.6 millimeters) circuit board with a Lattice ICE40UP5K-UWG30 FPGA, a 16-megabit SPI Flash for configuration (and other data) storage, a single RGB LED for blinkiness and a 48 MHz MEMS oscillator to provide a clock. Board component side. The other side is mostly just the USB pads. The whole thing is built so it can fit inside a standard USB port. 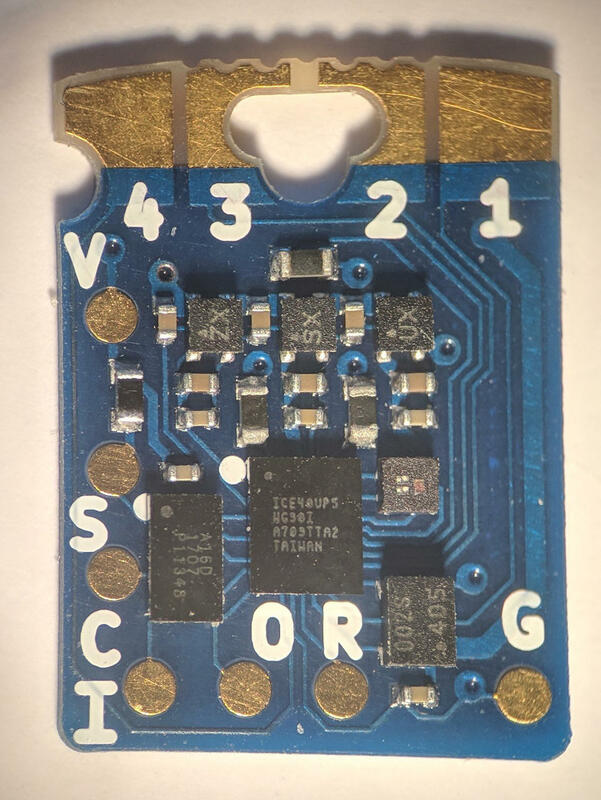 Production boards are meant to ship with a USB bootloader that allows new configurations to be uploaded to the board only via that USB connection, but hacker boards are provided completely unprogrammed (and untested). Unfortunately, this schematic leaves some things to be desired. 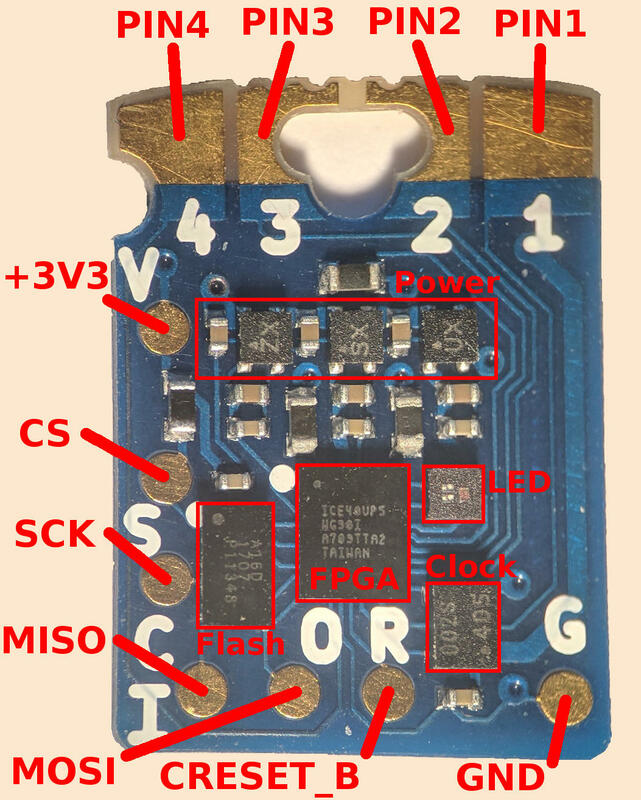 While it does allow us to see what parts are actually on the board and generally how they’re connected, it fails to clearly mark the external connections- power and data lines on the USB connector, test points and utility I/O pads. Here red and green lines are cuts, while black is raster engraving for marking. 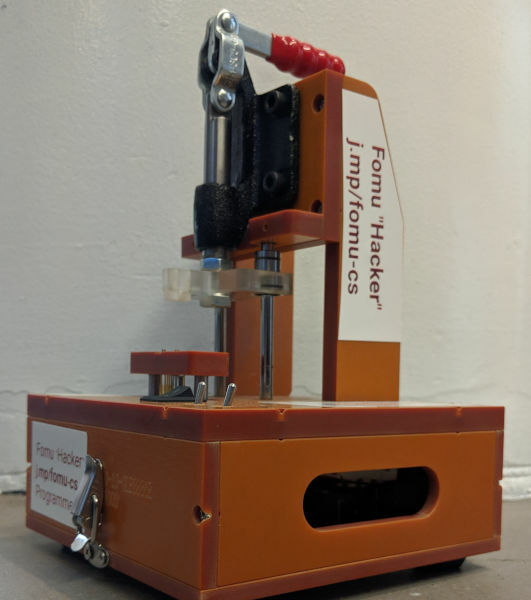 This jig is meant to be built up by stacking four layers of material, engraving a small pocket in the bottom to hold the board to program and inserting pogo pins in the small holes to contact with the test points on the board. This template helps us in that it has labels for the test points, though! All of the test points are clearly identified, except it’s unclear what voltage is expected on the power supply. By inspecting the board myself, I eventually determined that the test point for supplying power (marked VCC on the programming jig template) is downstream of the 3.3V regulator (not connected to the USB power supply pad) so it expects 3.3 Volts for programming. 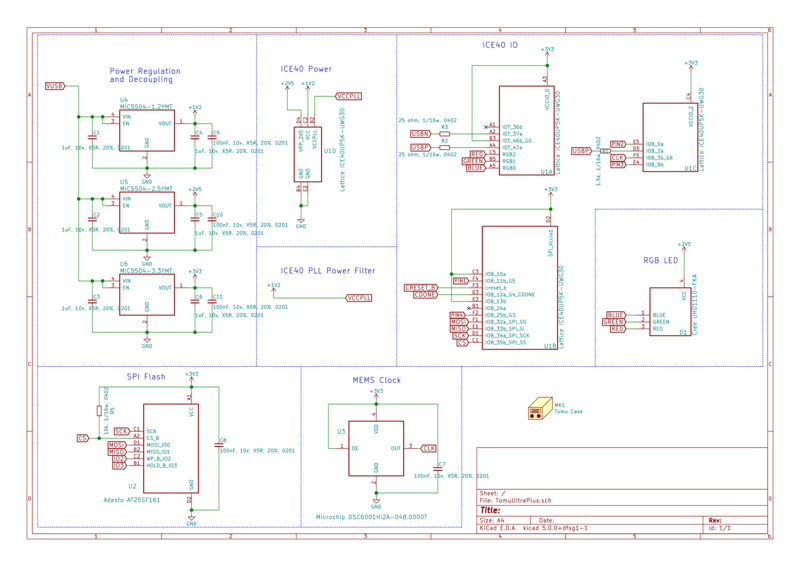 By way of improving the schematic, here’s that same photo of the board with the signal names from the schematic pointed out on each of the pads, and the individual chips pointed out. It’s a little bit ugly because the pogo pins I had ready access too are too small to nicely fit in the laser-cut holes so I had to carefully glue them in place. I gave up on that hardware after spending a while experimenting with it, and decided to design a custom programming jig that might be a little easier to ensure pin alignment is good. 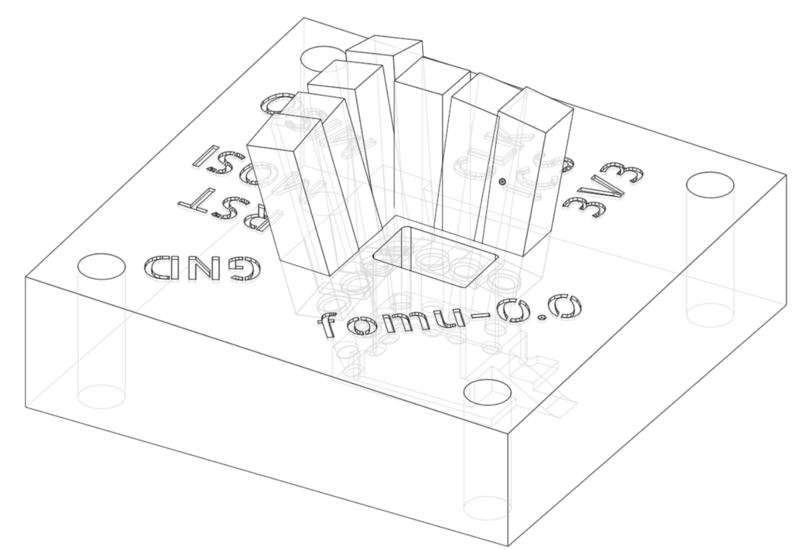 This is a little bit tricky because the minimum pitch of the test points is just 1.8 mm, which is not large enough for the 0.1-inch (2.54 mm) DuPont connectors commonly used for prototyping and desirable in this case because they’re very easy to connect to the Raspberry Pi’s GPIO header. The design takes great advantage of the flexibility of 3d printing for fabrication: it is easy to install the pogo pins off-vertical by making the (press-fit) holes at an arbitrary angle; this would be very difficult with conventional fabrication, but it allows the spacing of the pins at the top of the jig to be large enough that 2.54mm connectors can be used, despite the pad spacing on the board being only 1.8mm. On the bottom side, there are several narrow features that act as a shelf to support the board (which is 0.6mm thick) so its outside surface is flush with the bottom surface of the jig. A semicircular boss on one side mates with the cutout on the PCB to key the jig so it is obvious when the board is correctly oriented in the jig. A small cutout on one edge allows a tool to be inserted to pull the board out if needed, because the fit is close enough that it might stick sometimes (or a tool could be pushed through from the top). As a manufacturability consideration, the top surface has a slant between opposite corners. This improves the print quality on a Form 2- because dimensions on that side are not critical the part is designed to be printed with that side “down” (actually up, once in the printer) and supports attached to it on that end. By allowing the printer to gradually build up a slope rather than immediately build a plane, it can better produce the intended shape- an earlier version of the design with a flat top had a very rough finish because large and thin layers of material tend to warp until enough material is built up to be self-supporting. The one downside of these pins is the short tail, intended for mounting to a circuit board. While the aforementioned DuPont connectors can be mated to the tail, they are not very secure and come off at the slightest force. 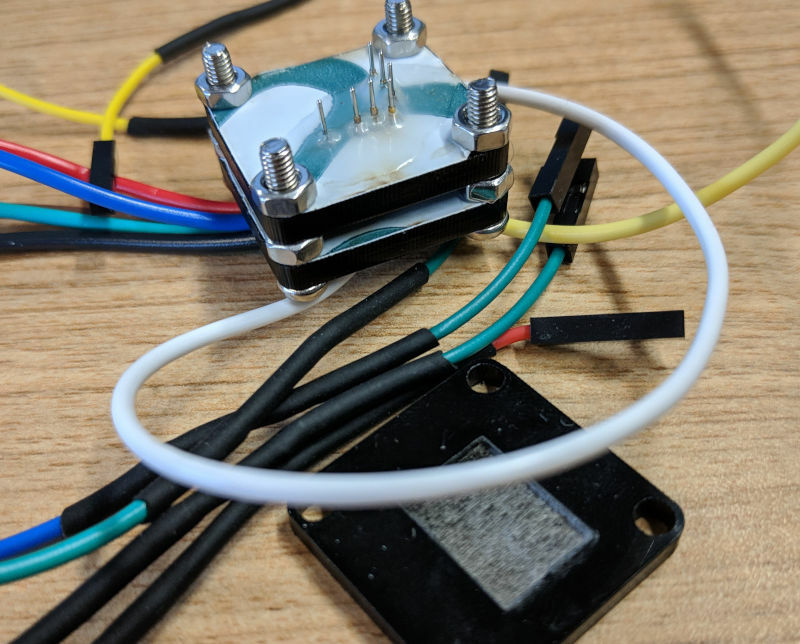 A revised design choosing parts for their function and not just immediate availability might prefer to use a part like 90101-AS, which is intended for wire termination rather than board mounting- then wires can be securely attached to the pin rather than tenuously placed on it. My workaround that didn’t involve buying more parts was carefully gluing the wires in place, which seems to work okay. Having built a jig that I could be confident would work correctly, we now return to the problem of actually programming the board. Connecting the new jig to my Raspberry Pi in the same way I did the first one, it failed in the same way- reading all 1s. To discount the first two possibilities, I was able to borrow Mithro’s professionally-built jig that already had a Raspberry Pi 3 connected to it. I didn’t have any credentials to log in to that Pi and use it interactively however, so I was limited to checking its wiring and carefully ensuring I connected my Pi to the jig in the same way, then try programming again. This also failed. Mithro's jig. It seems very cleverly built to me, clearly designed by somebody with a lot of experience designing these kinds of fixtures. I reported the bug and made a note of this in the documentation so hopefully nobody else has to deal with that problem in the future, even if the root cause is mystifying. Programming that to the board yields a blinking LED as expected, so I’ve achieved success in the basic form of this project by getting the FPGA to do something. Further exploration will involve writing gateware with Migen rather than straight Verilog (because I find Verilog to be rather tedious to write) and trying to build a system around a RISC-V CPU (because that sounds interesting). View the model at OnShape. This will allow you to view and make changes to the parametric model, which is what you’ll need to make most useful changes to it. View the STL online. A quick and dirty way to get an interactive view of the model. Download the STL. If you just want to try to 3D print your own, this is all you need. It may also be useful if you want to make changes using a 3d modeling program (rather than a CAD program). Download a Solidworks part file. This was just exported from OnShape, but you might prefer this if you want to use SolidWorks to edit the model. All of the official documentation for Fomu is available on Github. For basic information (such as what I referred to when writing up this project), that’s a great starting point. 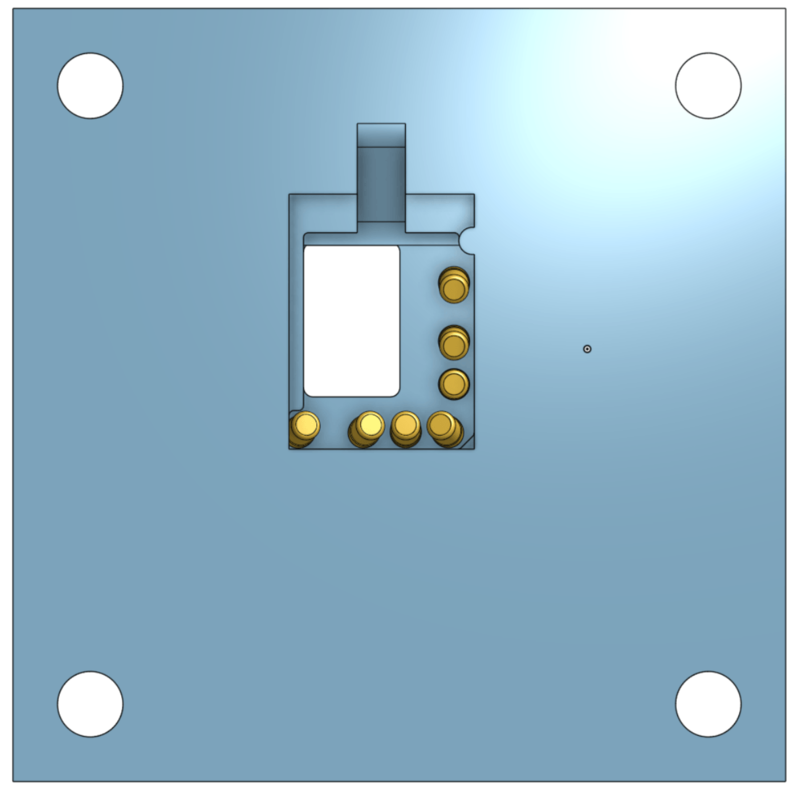 I designed the programming jig in OnShape which is a pretty good and very convenient CAD tool. FPGA vendors don’t publish all the information required to build configuration bitstreams for their hardware, possibly because they wish to support their side business in selling design tool licenses- this despite the fact that (anecdotally, since I can’t recall where I saw it) many FPGA developers say that vendor tooling is one of the biggest annoyances in their work. The open-source tools require a fair amount of painstaking reverse-engineering of chips to create!